One of the great characters in cinema, Tony Montana, constantly quoted and forever imitated yet never a touch on Al Pacino’s original performance in ‘Scarface’. While Al Pacino is the star of the film it’s still a brilliant addition of the gangster genre that manages to differentiate itself from the usual setting of the Italian Mafia by revelling in 80’s excess. On the surface ‘Scarface’ carries many of the hallmarks of the gangster genre; an immigrant’s rags to riches story, organised crime, a search for the ‘American Dream’ and Al Pacino, yet funnily enough its Al Pacino who sets the film apart from its contemporaries. The academy award winner is electrifying as Cuban refugee Tony Montana and undoubtedly steals the show. While he may not be the most developed or deep character in comparison to Pacino’s other famous mobster depiction in Michael Corleone (The Godfather) yet Tony Montana is one of Al Pacino’s great career performances. Ruthless, arrogant and violent, Tony is the embodiment of the dark side of capitalism. Most of his confrontations are highlights but it’s to a room of old money snobs at dinner where he delivers a damning and memorable outing of those who believe they are better than him. While we should firmly see self-confessed ‘bad guy’ Tony as a terrible human being, void of any goodness the audience finds itself oddly rooting for him in the end, like all the best outlaws in cinema. Director De Palma tries to give Tony some redeeming features and morals but his actions are so depraved by the end that these glimmers of goodness are insignificant. It’s the sheer entertainment that Tony provides through his wit and humour coupled with his unpredictable, volatile nature that endears him to audiences. It’s hard to assess whether Al Pacino is so powerful he overshadows his supporting cast or they are indeed as weak as they seem. It’s harsh to call them weak as they all do a fine job in their roles, it’s the fact that most of these characters are on the periphery and barely explored which is a shame. Tony’s best fried Manny gradually gets less screen time after their initial journey to America, while the woman in his life, love interest (Michelle Pfeiffer) and sister (Mary Elizabeth Mastrantonio), are one dimensional offering little value in the long term. There are hints of a deeper relationship with these characters but on screen they are largely ignored, for example an implied incestuous relationship with his sister nothing more than a suggestion. Easily the most outstanding sequence in ‘Scarface’ is the grand finale. A film that is notable for revelling in excess is given the climax it deserves, and needs in order to top its previous antics. What we are left with is a shootout of epic proportions, reminiscent of the end to Western ‘The Wild Bunch’ but eclipses it by featuring a one man stand against all the odds. Notably the film’s concluding scene features one of the most quoted lines of any film when Tony screams “Say hello to my little friend! 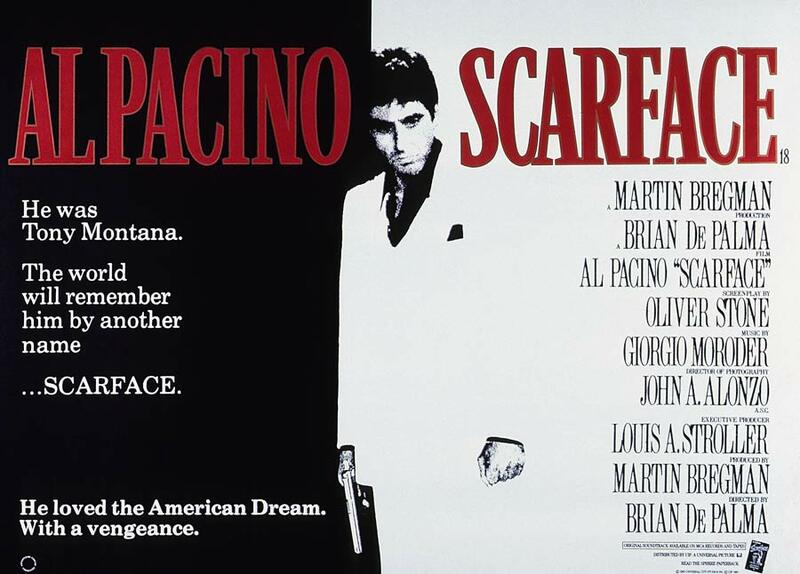 ‘Scarface’ remains not only a superb member of the gangster genre but also a distinctive take on the saturated topic. While most gangster films are dialogue heavy, dark and brooding in their atmosphere while ‘Scarface’ in contrast is bold, colourful, and vibrant almost working as a time capsule of the 80’s. This bold approach boarders on fantasy at times, perhaps being nearer to a Shakespearean tragedy with Tony; admirable in his loyalty and determination yet flawed in his paranoia and riches. While De Palma has crafted an excellent film it’s Al Pacino’s performance that will live long in the memory and make it stand out through the annals of history leaving little question of why Tony Montana has gone down as a cult hero of cinema.